In honor of Space Week, this installment of “Jenny, Y’know I Don’t See How That’s Going to Work But I Trust You,” is the truest, Tatum-iest of blessings. So, y’know, strap in and prepare yourself for some heartwarming hunks, some as(s)tronomical bulges, and also: space rollerblades. To begin, I benevolently grant you yet another excuse to sit down and watch this, the greatest cinematic achievement to occur in your (or any) lifetime: Jupiter Ascending. For those of you who have not yet allowed our lady and savior Jupiter Jones into your hearts, let me sum up: housemaid, Mila Kunis, discovers that she is, in fact, a Space Princess; with the help of her ex-military werewolf boyfriend (Tatum) and Sean Bee, she goes on a quest to trick the evil Space Capitalists into surrendering the Earth and restoring Potatum’s sick eagle wings. For starters, this movie is just so goddamn Beautiful — amazing sets and costuming (the kind that makes you wish this was a twelve part sci-fi novel series with an additional Silmarillion-esque history), Mila Kunis’s face, the greatest CGI spaceships I have ever and will ever care to see, fashionable garbage bags, Bees? also: Gugu Mbatha-Raw’s Face! But really, the whole fact that this movie exists is Beautiful, just heartwarming (I’m crying right now even thinking about it). Jupiter Ascending just means so much! So Much! For the future of cinema! For the future of narrative! Jupiter Ascending is, essentially, what you get when you throw a massive Hollywood budget behind that novel every single twelve-year-old girl (myself included) has secretly written. I mean, it has everything you (me @12) could ever want in a sci-fi story: silly and unrealistic inheritance laws, hokey science (differential equations – come on Potatum; come on), jokes about bureaucracy on that weird moon from Treasure Planet, Eddie Redmayne screaming for No Reason; it even has a Brandywine Cucumberpatch cameo. People always seem to take that explanation of it as a negative, as if I’m somehow proving their point that the movie is useless garbage; but listen: this movie is a Big Deal. I mean, the world had to put up with Eragon (also, the majority of cinematic history as an outlet for men to make movies by/for/about themselves), so the words: “I was born in the house of Leo, with Jupiter rising at twenty-three degrees ascendant. According to my aunt, this is supposed to mean that I am destined for great things and that I will find the one true love of my life” are our due. Jupiter Ascending is cheesy and predictable; it is rife with plot holes and questionable dialogue choices, but it is ours and it is glorious. It is the sacred female narrative that we all hold in our hearts and it is writ on the scale of the universe. Similarly, Magic Mike XXL is also a 2015 Channing Tatum movie indicative of the cinematic trend towards valuing the female audience. 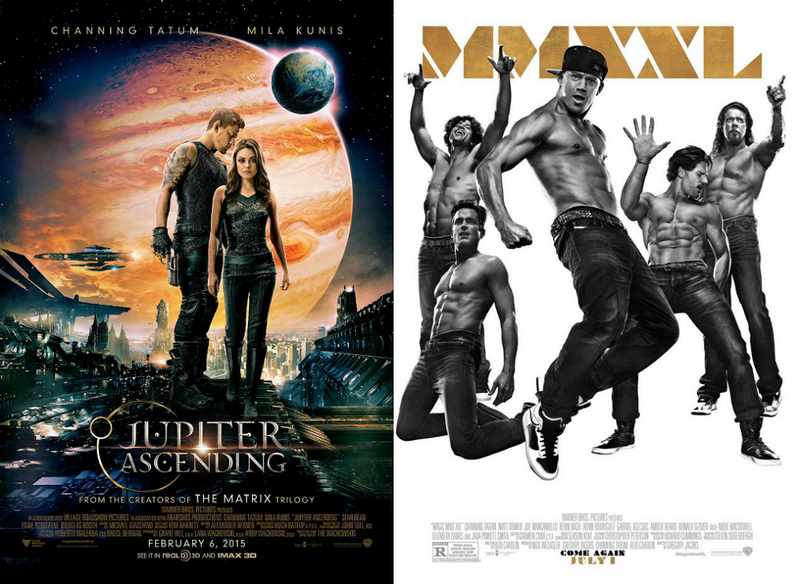 Where Jupiter Ascending is the song of the little girl we will always be, Magic Mike XXL calls out to the woman we have become. Basically, Potatum is out of the stripper game, but oh how his heart yearns to return. The whole movie is just Channing Tatum and all his hot friends loving and supporting each other/women. What more could you possibly need? (I’ll tell you what more: Donald Glover serenade; glitter paint; Jada Pinkett Smith; JADA PINKETT SMITH AND ELIZABETH BANKS AS UNAMBIGUOUSLY INTO EACH OTHER; women of all ages, body types, and backgrounds expressing desire in a way that is treated with respect and even reverence; honestly, just beefy tenderness for all). Anyway, this movie is set in Florida, and so you may be wondering “Why is this in the Space Week Double Feature? ?” — and all I can tell you is what I’m sure so many of you can see coming: son, that bod is out of this world. So, y’know, Treat Yourself. Listen to the song in your heart. You are made of the same atoms that make up the stars and you deserve it.